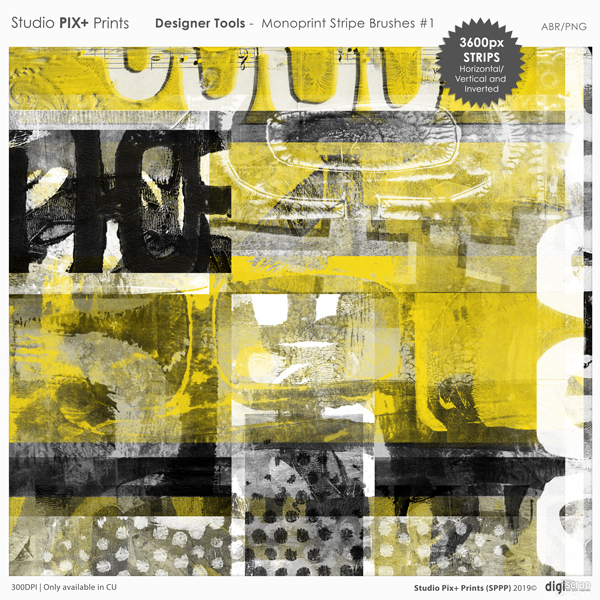 I made these 13 handmade special brushes from gelliprint prints. The printing of blocks and strips (segmenting technique) is regularly applied at gelliprint and inspired me to make these brushes precisely in this way. Making them rectangular (horizontal and vertical) in slide positive and negative creates a unique print where many variations are possible. Printing colors over each other (then just slightly shifted – see the top strip on the preview) also gives a great effect. Making the preview was no challenge at all, it just came naturally! The brushes (3600px) are specially designed as a design element for designers and therefore only available only in a all in one license: PU/S4O/S4H/CU. Dit bericht werd geplaatst in Digitale producten en getagged met Commercial Use, Digital Product op 19 maart 2019 door Studio Pix+ Prints.